The Mostyn family has enjoyed a long and illustrious military history from the medieval period right through to the Second World War. The achievements of two of the younger sons of the 3rd Baronet particularly stand out. 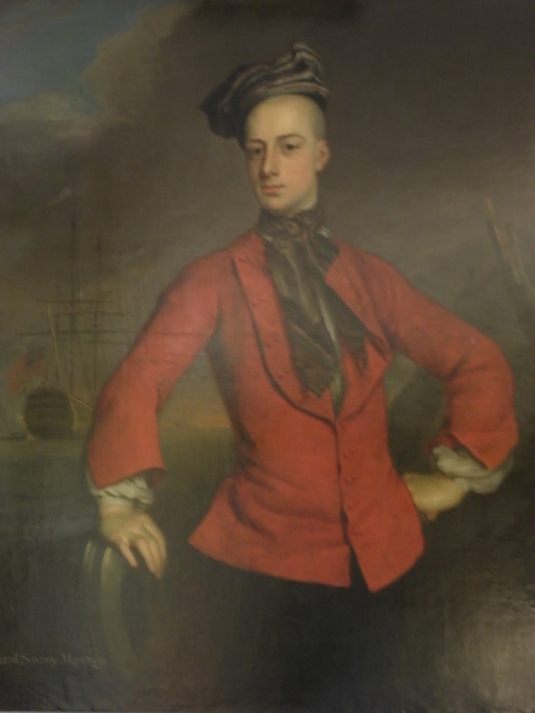 John Mostyn’s (c.1710-79) chosen career was in the Army, entering as an Ensign in 1732 and steadily rising through ranks to become a General by 1772. He served with distinction on the continent, earning plaudits for his gallantry; in 1768 he was appointed Governor and Commander-in-Chief of the Island of Minorca. His younger brother Savage Mostyn (c.1713-57) served in the Navy for most of his life, partaking in various theatres of war around the globe including the War of the Austrian Succession and the Seven Years War. Like his brother he rapidly climbed the ladder of promotion, the pinnacle of his career being achieved in 1755 when he was appointed a Junior Lord of the Admiralty. However, in 1745 he was involved in an incident off the French coast which almost wrecked his future promotion prospects. At this point he was in command of the 70-gun HMS Hampton Court and along with another three British ships became engaged with three French counterparts. After one of the French ships had been captured, Savage Mostyn led the pursuit of the remaining two rival ships. However, he eventually abandoned the chase and refused to attack, concerned at being too close to the French shore and fearing that he would be overwhelmed by the combined firepower of his opponents; the other British ships had failed to keep up with Mostyn’s pursuit. His actions were approved by the Admiralty but reacting to severe public criticism he demanded a Court Martial. He was again acquitted of fault, the proceedings concluding that he had done ‘his duty as an experienced good officer and as a man of courage and conduct’. He is also credited with the introduction of a standardised uniform for naval officers.